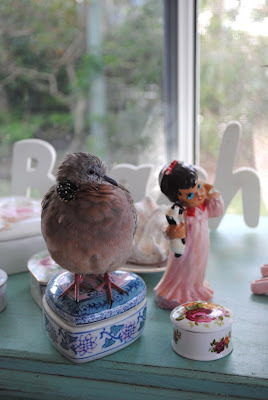 Beach Vintage: Remember that Baby Bird ? Oh my goodness...that sweet thing know a good thing when it has one...why would it ever want to leave? One smart bird you are bring up...what is it's name? You are just too sweet my friend. Happy Aussie day to you! Oh my..that is a precious story. He just has a vintage beach bird heart! OMgoodness! What a sweetie! Lucky you guys I think. What have you done??? You have followed your heart and nurtured a beautiful little soul back to life and you are clearly its life. A new member of your family for as long as it wants. I am positive it will have a wonderful life with you! Looks like that bird thinks it is part of the family! Obviously knows when it is on to a good thing. It looks like this little angelic bird has decided to adopt you. What a magical gift! I'm sure the Beach Vintage lifestyle would be very enjoyable for the birdy! Have you named it yet?? OMG, so absolutely adorable! I guess you're its permanent abode. hahahaha... he is so cute.. and funny... what type of bird is it? Oh what a sweety pie! He just thinks you're his mommie. He never wants to leave your lovely home. I also saved one of these from a cat once - they're pretty things. Btw, this isn't a crested pigeon. It's a spotted dove, which is an introduced species. The crested pigeon has similar shape/colouring but is an Australian native bird and has a little mohawk. Sorry to be a know it all and of course I would save any and all birds (except, perhaps for Indian Mynahs, which really are a pest)! Well, I think it's nice for both you and the bird to have a good friend. hola simone!! !the little bird knows exactly where he want to be...in the best place!!! !enjoy your long weekend! !muchos besos!!! How lovely... it's hard to keep a little bird alive when it was so small when you found it... It's obviously meant to be :) Such a cute photo! A wonderful ending :) or should I say beginning for Mr. Bird. You should name it. You should definitely name her/him! Poor little bird thinks you're it's mommy, and I guess you are! Have you and your daughter read "Are You My Mother?"? What an appropriate book for you two to read. How fun for you and your family to have this "guest". what a sweetheart! it reminds me of that book by dr. seuss i think "are you my mother?" You've made a friend! Great photo by the way! Oh Simone, this made my day! What a sweet little bird. It's so funny that he's really made himself part of your family. Enjoy the rest of your holiday weekend! I resqued a baby (1" barely feathery) newborn three years ago. Her mother had made nesting material out of some plastic (oh pul-lease people, RECYCLE! Keep it out of nature!) string which had gotten wrapped around the leg, mother threw her out of the nest, sigh. The vet had to cut off the foot the plastic had grown into, right before she said "She'll be yours forever, are you willing?" I fed her every 5-20 min. the first 30 days, the feeding times graduated into loner increments of time, and my little one-footed bird began to talk to me. She began to learn how to squak to voice her displeasure, or when one of her two water dishes (one for bath, one to drink) was getting past an acceptable level of low. She has to have her own room due to my cats thinking either a) lunch, b) a new toy. Hence she has her own tv to avaoid sensory deprivation, in between times I go in her room to sew or do crafts every day. She will be four years old this coming July, is a joy to live with, and I will be "Mom" forever to her. Your bird has obviously chosen you over Mother Nature. You have done the right thing. So sit back, relax, and enjoy the love! Oh, that is just beautiful! And I loved the movie too....gorgeous house and gorgeous Bakery....but what about the vegetable patch, something about that really got me!! And yes, some extremely funny bits too! It looks so sweet perched among your things, like it belongs right there! What a cute picture. I don';t think it has any interest in leaving your quaint household. Goes with the story "Are you my Mother? Have a good one! Enjoy your day. Oh, how sweet! I just love birds. Well, you're a good mama. And it loves you. sweet bird. a testament to your florence nightingale ways. Oh my this is just adorable, your lil girl must also be enjoying having a birdie! Just a quick note to wish you a wonderful day Simone! have a very sweet day (and Astralia day). She (he?) knows she belongs with you. How wonderful! That warms my heart Simone! What a lovely and grateful little bird! !